Breathing in Grace: A Custom Order!!! Every once in a while, I get a custom order. That's exactly what this little cow is. He was ordered by a certain little fellow named Sawyer....and he was probably more specific than anybody I've ever made anything for. I had a pattern and when I showed it to him, he plainly told me that was not what he wanted. He loves black and white cows....and that's what he wanted. Plus, he wanted "brown on his face". I told him recently that I almost had his cow finished and he asked me if it had brown on it's face....I told him "yes'. Is it black and white? Yes. 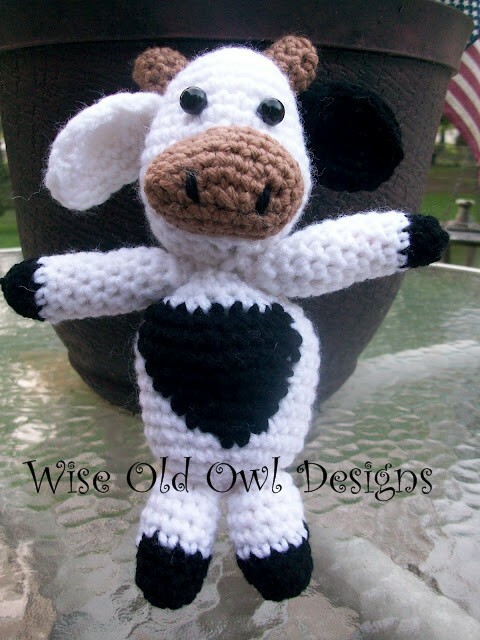 Does it have udders....uh....no, Sawyer, Nannie made a boy cow!!!! Oh....and in case you're wondering....Sawyer is our youngest GRANDson! His big brother, Sam has ordered a monkey....so I've got 'till next Wednesday to get it finished since that's our big boy's birthday. So...Nannie is off to start crocheting a monkey....pics to come. Jenny and Teddy Creation on Etsy. LOL...only a grandson could have such specific orders.